A few people had recommended Lujon in Keston to me. They had recently changed names to Herberts, so I thought it would be a good time to try them out. 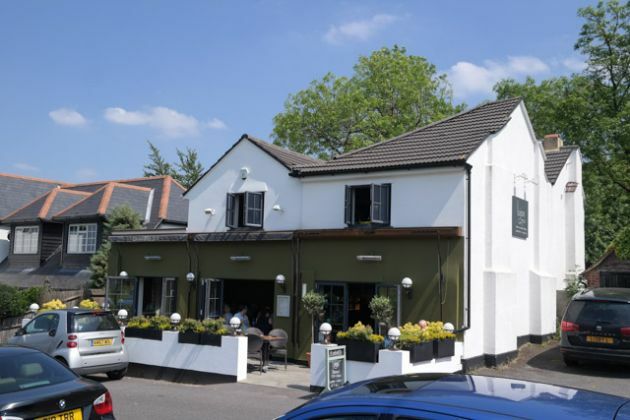 Herbert’s is situated across the green, parking wasn’t an issue for us but if it does get too busy, there’s a car park down the road. We were met at the door and shown immediately to our table. The waiter made us feel very comfortable with our (not quite so) baby, JW. He spent time talking through the menu and options (“the 3 course meal is a lot of food, so if you are not really hungry, then go for the two courses”). Decor-wise, seem to be going for the shabby chic look, with cream / green walls, a pretty display cabinet at the back and different kitsch coloured chairs. The large mirror at the back made the room appear a lot larger and brighter. There was a nice lounging area was also provided, with leather chairs, Sunday papers and a chess board. They had a patio eating area which overlooked the common. All in all, a wonderful venue. I ordered the Einstok, a very nice lager, Claire asked for a white wine. Later on, as Claire was driving, I ordered a red to go with my beef :-) Table water was provided for free, and poured/refreshed throughout the meal. 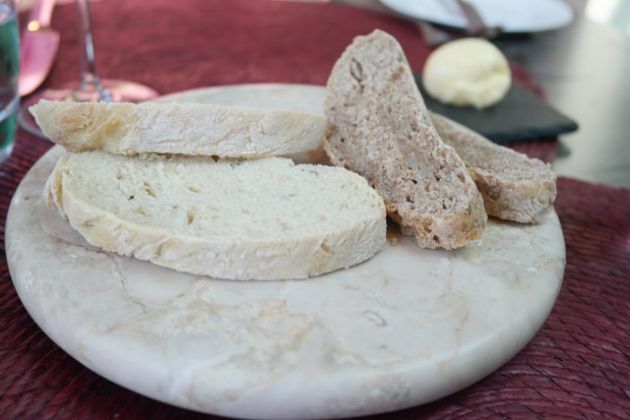 As we weren’t THAT hungry, we didn’t order a starter, but instead had bread with butter for £1 each. Claire ordered the roast chicken supreme, I asked for the roast beef. For JW, we ordered the children’s roast beef. 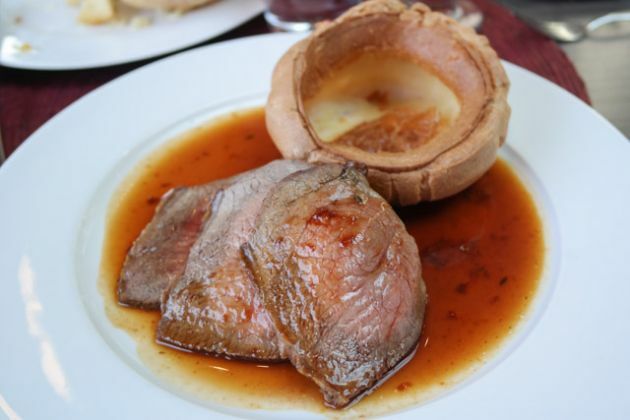 Food was served quickly, with our roast meat and yorkshire coming out on one plate, along with a leek crumble / gratin, cauliflower cheese (yippee!!! ), roast potatoes and vegetables. 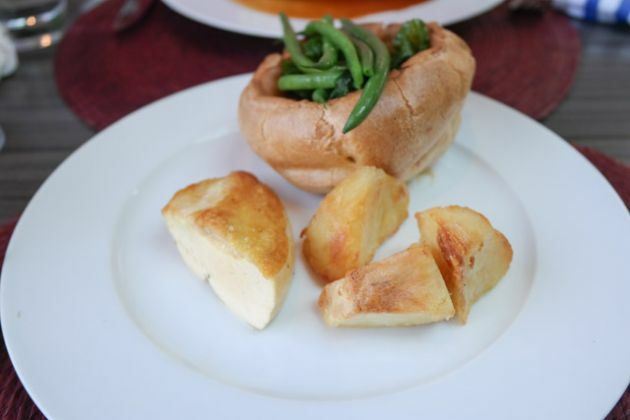 JW’s lunch had the beef inside the yorkshire pudding, along with some vegetables – his roast potatoes were served on the same plate. We asked for the gravy on the side (even though it was gluten free). Bizarrely, even though I ordered roast beef, I had actually been served Pork Belly (which wasn’t even on the menu!). Whilst it looked delicious, for the sake of the review, I decided to send it back and have my original order, the roast beef (this was quickly sorted out). The beef was wonderful, cooked to my liking (medium-rare), and had 4 slices!!! A h-u-g-e amount! 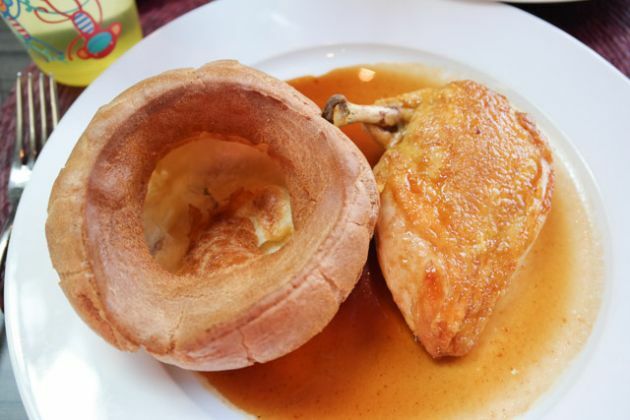 I tasted Claire’s chicken supreme, equally nice, being corn fed and extremely moist. 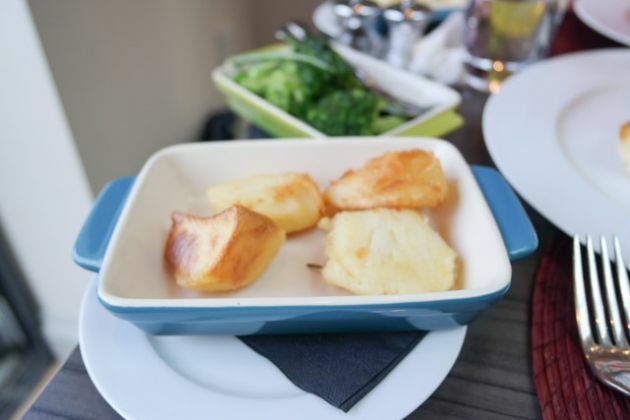 The roast potatoes were good, crispy on the outside with a nice texture. I like it when a venue serves the potatoes on the side as it ensures they are crispy (otherwise, the gravy is soaked up before the plate is even served). The cauliflower cheese was pretty much perfect, slightly burnt cheese with a lot of sauce. The leak crumble wouldn’t be something I’d normally eat, but it was very good. Lastly, the vegetables – broccoli, kale and green beans. 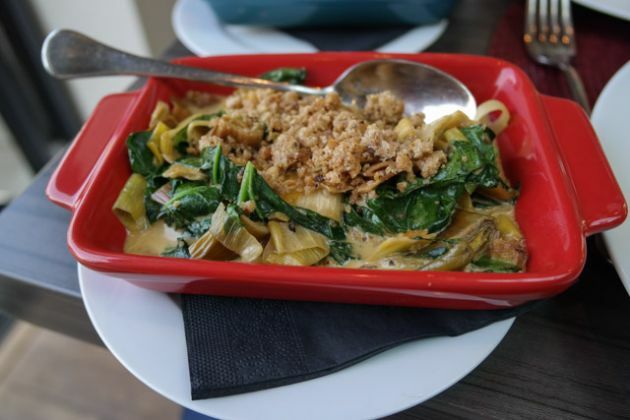 A good selection of greens, and also cooked to my liking (al dente). As the menu was set for 2 or 3 courses, we each just “had to” have a dessert. 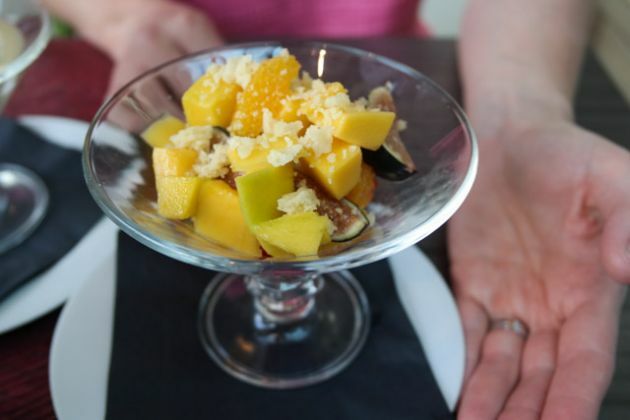 I have mentioned previously, JW was off gluten and dairy, so we asked whether a simple fruit salad was possible; it was, so that was him sorted. 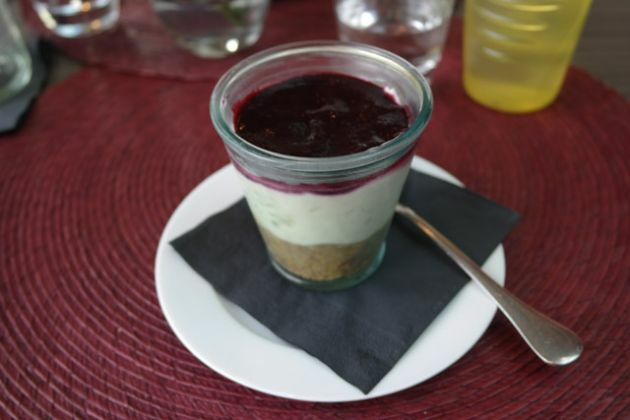 Claire ordered the lemon posset, I asked for the blueberry potted crumble. As what seems to be custom at the moment, I also ordered an espresso. The desserts came out quickly – JW’s “simple fruit salad” looked amazing! It consisted of: fig, mango, orange segments and raspberry coulis. He thoroughly enjoyed it all! My cheesecake was very rich and delicious, certainly a lot of it. 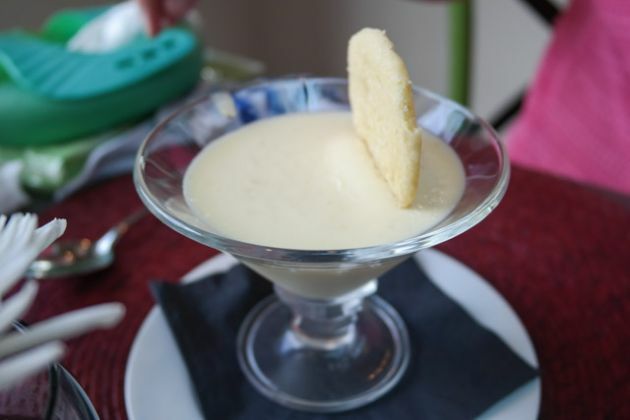 With the lemon posset being very light and fresh, Claire’s dessert was a perfect finish for her. They had a baby changing area, which is more than quite a few places we have been to. The high chair was clean and sturdy. The waiter was extremely welcoming with JW, which helped make us relax. I did initially think that £11.95 for a children’s menu was a high price, but he kindly charged us £5 in total for JW’s food (a complete bargain). The children’s roast was a good size. The service was excellent (even with the slight mix up of the main course), we were made to feel so welcome. 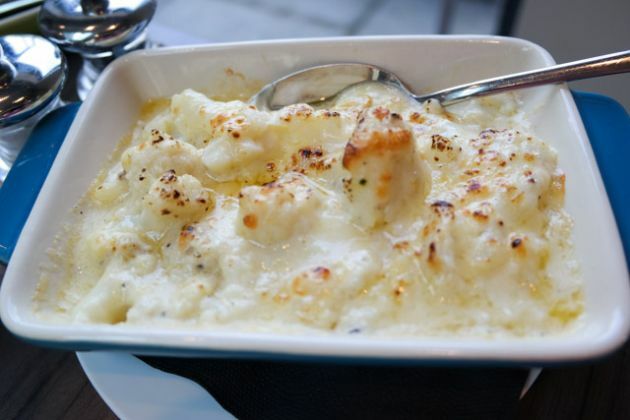 The food was top-notch, and such a great selection of side dishes, including my favourite, cauliflower cheese! We were very pleased with the food for JW, especially the unusual and wonderful fruit salad. The menu was reasonably priced considering the serving size and quality. I should mention more often if this is the case, service was added to the bill @ 12.5%, but they more than earnt it! 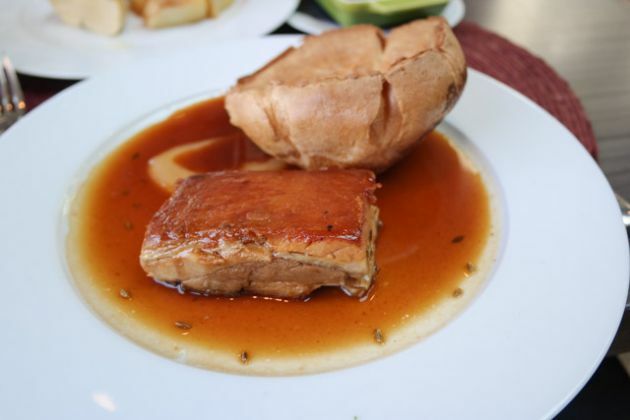 Definitely one of the Best Sunday Roast lunches in Bromley – you owe it to yourself to visit!